Bart Ehrman intrigues me. Here’s a guy who apparently could do real research and perhaps even add something to the discussion of Biblical and extra-Biblical writings, but he doesn’t. It seems to me that he is being purposefully deceptive (i.e. he lies). An alternate theory is that he is really quite clueless, but is able to market himself to publishers and others who are similarly clueless. Or, … well, I can’t really think of any other options at the moment. I don’t want to presume that he’s being intentionally deceptive, but he does seem smart enough to know what he’s saying isn’t correct. 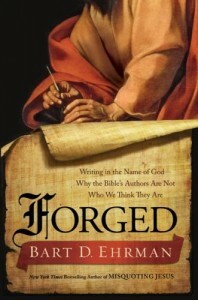 Forged is Ehrman’s latest offering, continuing on in the tradition of really bad scholarship that he’s shown in Jesus, Interrupted and other books. I haven’t read Forged, however, and I’m not planning to. I’ve read enough of his stuff to know how he writes, so when I read in-depth reviews by people like Ben Witherington, who is a real Biblical scholar, I know enough about the book. So, this post isn’t a review by me, but rather a recommendation to check out Witherington’s series on the book. Bart, is actually swimming against the tide of the scholarship, even on the Pastorals. And here I must register a big complaint. Look at the footnotes to Chapter Three. Do we find any evidence at all that Bart has even read a broad and representative sampling of commentaries on Paul’s letters, or even on the Pastorals? No, we do not. Maybe he has, but his views only match up with a sort of cherry-picking approach to the scholarship, highly selective in character, and tendentiously favoring only the more radical or controversial commentators on Paul. It is also worth noting that he relies heavily on the older scholarship of A.N. Harrison or N. Brox or the eccentric work of D. MacDonald. But this older scholarship has long since been critiqued, and largely discarded as inadequate. Bart however trots it out as if: 1) it was news, and 2) such conclusions would go unchallenged today by the majority of scholars. Wrong, and wrong. Witherington agrees with him on many points, as he discusses forgeries that everyone believes are forgeries. It is when he moves into Canonical documents that the problems arise. Ehrman seems to approach his writing along the lines of a hack journalist, who is more interested in selling his position (and his books) than actually reporting the truth (of course, these days this description could apply to the majority of what passes for journalism). He is, perhaps, the Rush Limbaugh of liberal Biblical scholarship. He tells a good story; the problem comes in when you start fact-checking. You can read parts 1 and 2 of Witherington’s analysis here and here. This entry was posted on Wednesday, April 6th, 2011 at 4:07 pmand is filed under . You can follow any responses to this entry through the RSS 2.0 feed. You can leave a response, or trackback from your own site.